Get the free Cheat Sheet and use it as a training and quality-control tool for staff. 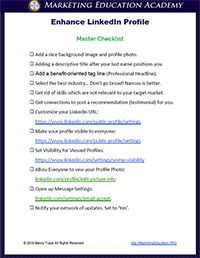 This is the same Cheat Sheet and Reference Guide we give to our paid certification students. Get yours free. On the next screen (after requesting the Cheat Sheet), you'll get access to our advanced LinkedIn lesson where we show you how to replicate the entire campaign that added $485,355.00 to a pipeline in just 8 weeks. See how new prospects can flood your sales funnel with new requests for proposals, quotes and appointments. You'll learn how to generate the highest quality leads without spending a penny on traditional advertising. It all starts with an optimized profile. Download the free cheat sheet and reference guide now.